The best breakfast this side of New Orleans is served on Sunday mornings at The Ozona Pig. 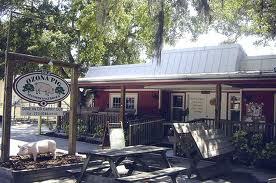 It's not right down the street ... unless you live in Ozona, Florida right across the street from Molly Goodhead's. It takes me about 45 minutes to get there from my house ... even on Sunday morning. Ozona Pig is a barbecue restaurant .. and a good one. Opened Monday through Saturday for lunch and dinner, The Pig decided to share their kitchen with a talented cook and her devoted husband. Donny Ford is the guy who created the electronics for my man cave (consequently, he's my hero) and he is married to Ann ... who has always wanted to have a breakfast restaurant. Their friends own Ozona Pig ... don't typically open on Sundays ... and offered the place to Ann and Donny to do their magic. Donny invited Debbie and I to check it out last weekend. I'll admit, driving to Ozona on Sunday morning to sample breakfast sight unseen was not on my bucket list. But ... it has made my Top 10 all time favorites. And the specials .... 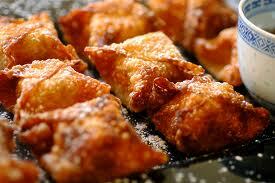 Deep fried apple filled won tons with caramel sauce, stone crab omelet and to die for shrimp and grits. By the way ... my friend Chrissy gave me a shout out or tagged me ... or something like that ... you know, mentioned me in her blog I Shoulda Been a Stripper ... She is Cleveland's first lady ... funny, irreverent and a great writer. Check her out. Also check out Gillian at by A Daft Scots Lass. She's originally from Scotland, now living in South Africa with two wee lassies aged nearly 8 and 4... A working mum blogging her life and funny as hell. Be sure to read ... BOSSY BETTY who says "In my old age, I plan to become the crazy cat lady in the neighborhood--the woman both pitied and viewed with a strange sense of fascination by all. That life of fame will have to wait though. These days I am a hard-workin' teacher and mama to two boys. I've been married to a man--a real, live man-- for 29 years. He's real nice and he's clean too! In the mornings I go Nordic walking around my neighborhood and at night I sleep the sleep of the happy." These are three of my favs. Joel! Will you marry me? Thanks for much for the shout-out, you Big Ol' Man!!! Next time you are in town I"m gonna get you some hash browns and pie! I might need to make a trip to Florida now. Breakfast is my FAVORITE meal of the day! @Gillian ... You are most welcome..
@ Betty .... Mmmmm hash browns and pie. Yes marriage is a good option..
@Chrissy ... Come to Florida and we'll do breakfast.